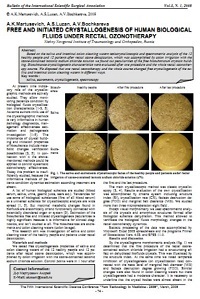 Based on the saliva and intestinal colon cleaning waters teziocrystalloscopic and spectrometric analysis of the 12 healthy people and 12 patients after rectal ozone detoxication, which was accomplished by colon irrigation with the ozone-contained isotonic sodium chloride solution we found out peculiarities of the free biosubstratum crystals building. Biosubstance crystallogenesis characteristics were evaluated after one procedure and the whole rectal ozonotherapy course. We disposed that one rectal ozonotherapy and the whole course changed free crystallogenesis of the saliva and intestinal colon cleaning waters in different ways.